Stand-up comedian and actor Ari Shaffir describes his comedy as a puppet show, but way filthier and without the puppets. He grew up orthodox Jewish, spent 2 years in a yeshiva in Israel, and came back to America to lose his religion and become a comic. Now with two hour standup specials and his own late-night TV series coming up, Ari is a “gifted comic unyielding in his art,” becoming “a real force to be reckoned with” (LA Weekly).Ari’s second hour standup special Paid Regular premiered on Comedy Central in 2015. His first hour special, Passive Aggressive, premiered on Chill.com in 2013, and premiered on Comedy Central in 2015. His standup album Revenge for the Holocaust was released in 2012 and went to number 1 on iTunes and Amazon.com the week of its premiere. Ari’s weekly story-telling series This Is Not Happening premiered on Comedy Central in 2015. 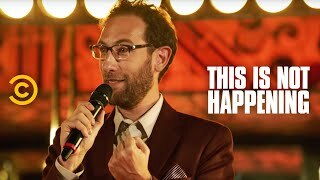 The show, which originally debuted as a web series on CC.com, features Shaffir and his comedian friends telling hilarious and true stories in front of a live audience at LA’s most distinguished gentlemen’s club, Cheetahs. Season 2 of This Is Not Happening will premiere in 2016 and it was recently picked up for a third season on Comedy Central. In addition to his TV and standup projects, Ari also hosts the wildly popular podcast The Skeptic Tank, a weekly interview show where he chats with everyone from parents to comedians to prostitutes “to help better understand humanity and also to make fart jokes.” The podcast is consistently among the top-rated podcasts on iTunes and averages over 100,000 downloads per week. Ari is a regular panel guest on the popular TV series @midnight and has appeared on Comedy Underground with Dave Attell, both on Comedy Central. He has also been featured on Showtime’s The Green Room with Paul Provenza, Comedy Central’s Brody Stevens: Enjoy It and HBO’s Down & Dirty with Jim Norton, and he appeared alongside Rob Schneider and Adrian Brody in the film InAPPropriate Comedy. He performs standup to sold out crowds nationwide and has been featured at the prestigious Montreal’s Just for Laughs Festival, San Francisco’s SketchFest, SXSW, the Bridgetown Comedy Festival and the Moontower Comedy and Oddity Festival.For more information go to www.AriShaffir.comFollow Ari on Twitter - @AriShaffirMust be 21 & up to enter; except on Friday's at 10:30pm which is 18 & up to enter.